Global industrial tapes market expected to generate revenue of around USD 73839.8 million by the end of 2024, growing at a CAGR of around 6% between 2018 and 2024. Industrial tapes are used for the heavy duty applications in the industry as they require a sustainable range of tapes. The report covers forecast and analysis for the industrial tapes market on a global and regional level. The study provides historical data from 2015 to 2017 along with a forecast from 2018 to 2024 based on revenue (USD Million). The study includes drivers and restraints for the industrial tapes market along with the impact they have on the demand over the forecast period. Additionally, the report includes the study of opportunities available in the industrial tapes market on a global level. In order to give the users of this report a comprehensive view of the industrial tapes market, we have included competitive landscape and analysis of Porter’s Five Forces model for the market. The study encompasses a market attractiveness analysis, wherein product type segment, tape backing material segment, and application segments are benchmarked based on their market size, growth rate, and general attractiveness. 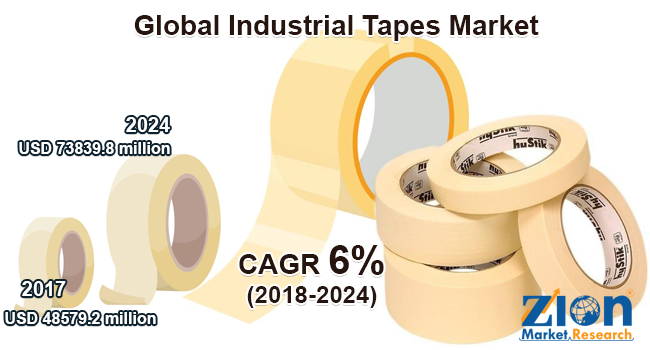 The study provides a decisive view of the industrial tapes market by segmenting the market based on product type, tape backing material, application, and regions. All the segments have been analyzed based on present and future trends and the market is estimated from 2018 to 2024. The regional segmentation includes the historic and forecast demand for North America, Europe, Asia Pacific, Latin America, and the Middle East & Africa. This segmentation includes demand for industrial tapes market based on all segments in all the regions and countries. The key players operating in the global industrial tapes market include Eastman Chemical Company, Adhesive Applications, Von Roll Holding AG, Avery Dennison, Saint-Gobain SA, Henkel AG & Company KGaA, The Dow Chemical Company, Berry Plastics, Ashland Inc., Advanced Flexible Composites, Avery Dennison Corporation, Merck Group, Sika AG, Microseal Industries, and H.B Fuller. The other players include Essentra Specialty Tapes, FLEXcon, Intertape Polymer, Coating, and Converting Technologies, Adhesives Research, MACtac, Lamart, PPI Adhesive Products, Shurtape, DeWAL Industries, Scapa Group, TaraTape, Adchem, Chomerics, Navilux, CTT, Achem, Syntac Coated Products, and Necal. These players adopt strategies such as agreements, collaborations, new product launch, partnerships, and for acquiring a high position in the global market.